I really loved this book! I felt so badly for Ever. She is trapped inside her own body, and can't stop the cycle of overeating, guilt, and self-loathing. Her inner critic is on high alert, and constantly berating her. Ever calls her inner voice Skinny. Skinny loves to bring Ever down and is constantly saying such mean things to her. 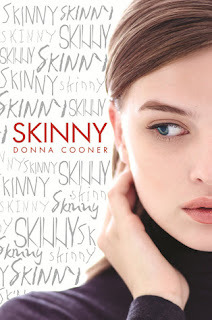 By the way, I know that Skinny is actually Ever, but the book is written in a way that Skinny and Ever almost feel like two different people. Fueled by fear and a sliver of hope for a better future, Ever decides to undergo gastric bypass surgery in a last ditch attempt to lose weight. She starts to lose weight and change, slowly but surely, and is supported and coached by her best friend. Ever has an uphill battle, with some slip-ups along the way, but is ultimately successful in losing a significant amount of weight. Having worked with people before, during and after weight-loss surgery, I know enough about the process to be able to tell you that Skinny was an accurate portrayal of the process of weight-loss surgery. Surgery is not a cure-all, it's simply a tool to help people lose weight. Losing weight after surgery still requires a huge amount of work, and Cooner was great about showing a realistic glimpse of a post-surgical lifestyle. I loved that about this book. But the best thing about Skinny, for me, was how Ever battles her inner critic. Even after she loses weight, she still has trouble with her cruel inner voice. Ever pushes people away, due to fear of ridicule, and has trouble opening herself up to friendships and especially love. The way Ever finally confronts Skinny and truly sees herself for what she is was the best part of the book. My other favorite part of Skinny was that the book was a slight retelling of the Cinderella story. I love Cinderella retellings and Skinny was a unique twist on the classic story. There was a ton of character growth in this book, not just in Ever but in other characters as well. I love watching characters mature and change. I would highly recommend Skinny. It was an excellent read, and I look forward to reading more from Donna Cooner! I have been wanting to read this one for a while. I really like your review on this one.